The muddy shoes are clean and dry, the pile of running clothes washed, and the race report posted. My blisters have dried and don't hurt any more when I walk, my ravenous hunger for food is slowly under control and I ran my first recovery run (10K) last night with Brigit and a few other friends at our running club last night. Our friends at the running club last night were awed by our "accomplishment". Though I am overjoyed at finishing the 100 miles, I don't really feel like I accomplished anything out of the ordinary, I think with the right training a lot of my running club could do it too. From my perspective, what I accomplished was the dream of completing the 100 mile distance, nothing more. I've read 100 mile race reports where runners have said the race changed their lives forever, some had spiritual awakenings or at least walked away with new perspectives on life. I walked away with sore feet, a big smile, and the satisfaction of completing the race with a friend. From reading other blogs I know a lot of people are searching for something in life when they enter a 100 mile race, maybe that's why they "find" themselves. I don't knock them, but I guess I wasn't searching for anything when I ran, I just ran (and walked). Well, I guess I did find some things at the first annual KuSuH, namely new friends, friendly helpers and much kindness at the aid stations, not to mention a well organized race, a tough but beautiful course and a caring and dedicated race director and crew. I also didn't experience some things that I had expected. I expected being stretched to my very limits, physically, emotionally, maybe even spiritually and having to crawl over the finish line with my last strength before collapsing in a heap. I had a few issues to be sure, like blisters and fighting to stay awake, but my legs remained in good shape, my energy level was never critical, and my attitude remained positive. Hmmm, maybe I didn't run fast enough, something to think about anyway. I think the training that Birgit and I did was just about right for the race, at least for the pace that we ran it. Our finishing time of 27 hours 14 minutes was about 45 minutes slower than what we estimated we would need, but I blame this on the lousy weather. I believe if it hadn't rained we would have finished in 24-25 hours, maybe even faster. Only one way to find out I guess. As the music faded, we headed out for the first running on the 1st Annual KuSuH Trail 100 race. Birgit and I stayed at the back of the pack, not allowing our enthusiasm to get the best of us. Our small race group of 26 made a loop around the track, than ran past the small crowd that had come out to see us off on this cold and rainy morning. We exited the stadium and headed out of Oberderdingen, turning right and into the field ways and wound our way towards the forest in the distance. The first hill came quickly and we settled into a swift walk, bounding over the top and picking up our running pace again, a maneuver we would repeat throughout the day and night ahead of us. The field way gave way to the first forested section, we fell into a relaxed pace as we traversed the single trail though the woods. Birgit prefers to take the lead on single trail, easier to seen the upcoming roots and stones she says, not untrue. 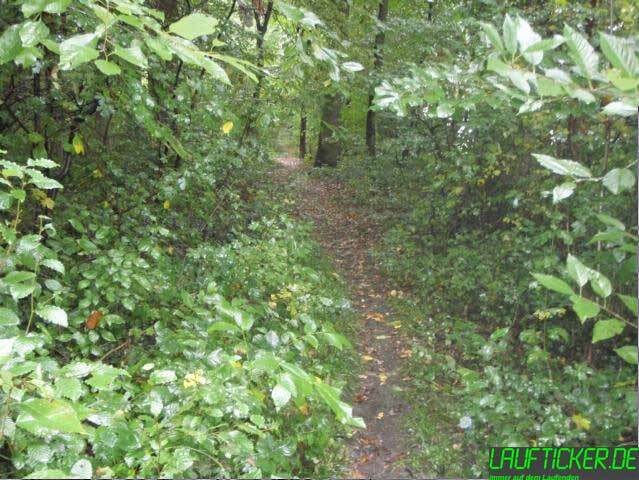 We chatted off and on as we ran; a misty rain accompanied us as we wound our way up and down the forest paths. The trails were a bit muddy but fairly civilized as we continued, this would change soon enough. The single trail changed to forest service paths, we crossed a county highway, on through the next forested section and the town of Bretten beyond. Soon we left the paved road and were running through a grassy field, the drizzling rain continued and our feet were quickly soaked to the bone. 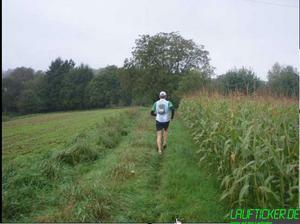 We ran over several gentle hills, enjoying the quiet and scenic paths. We were chatting about one thing or another when my cell phone battered the silence. Very few people have my number and all knew that I was running a race, so I deduced that it must be something important...Bernd was on the phone, he was going to meet us later and wondered how are progress was. We were ahead of schedule so adjusted our meeting time accordingly. As I hung up we turned onto a slick, muddy path that was like walking on ice. We somehow made it over the section without landing on our bottom and on to the forest service path beyond. From here we were able to run several miles, pausing to walk over several hills, but generally making good time. Gradually the trail turned to single trail, but still runnable. There was one section through here that was particularly miserable, logs, mud, briars and no real path to speak of, trail running at its best! We passed a control station and continued on through the forest, eventually running through the town of Nussbaum, where we passed the oldest participant (65) Bernhard. He had started two hours earlier than the rest of us, so we were surprised that we caught him so soon. We left town and were soon on single trail nearing the second aid station Koehlerwiese, situated in a forested section not far from Nussbaum. We were greeted by a half dozen or so volunteers manning the station and they quickly asked what we needed and scurried around fixing sandwiches, filling our backpacks and giving us a breakdown on the trail ahead. After a bit, we were sent off with full bellies and cheerful wishes of good luck. The rain continued as we made our way down a long descent that brought us out of the forest onto a asphalt field path. 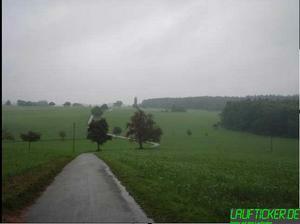 As we made our way over open fields the rain started pouring down, we had no choice but push on. We crossed another county highway and wound our way back into the forest, at least some relief from the wind and the rain. 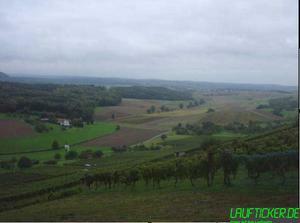 We climbed again, over a series of rolling hills, mostly single track, the rain made the way treacherous. 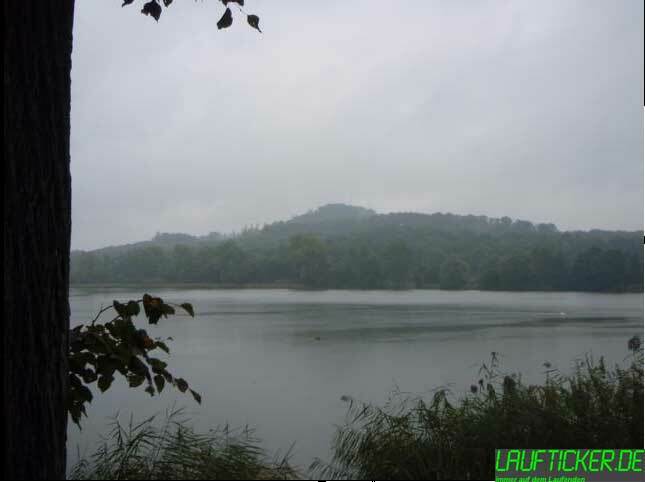 We ran past a cemetery on the edge of the town of Ruit, than headed over another hill to the Aalkistensee, a local lake that is a popular tourist target for hikers. From here it was an almost straight shot to the town of Knittlingen and the next station, the only problem, a little ole hill in between with winding, slippery, boot-sucking mud! 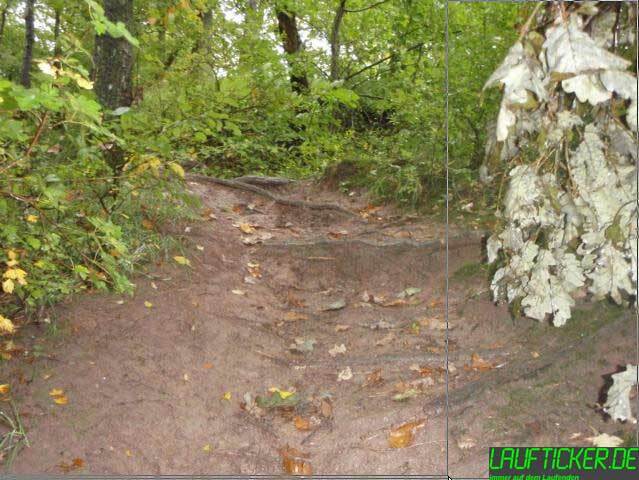 We ran most of this section during training, but with the rain the trail was slick, we had to gingerly make our way over portions hanging onto bushes and trees to keep from landing on our backs in the sticky ooze. By this time we were somewhere between 45-50 km and Birgit was fighting a low point. I think we were both relieved when we arrived in Knittlingen at the aid station at the edge of town. The aid station in Knittlingen was a major station, i.e. is runners could leave drop-off bags here. We were almost an hour and half ahead of our race plan, so decided to spend some time here and change into some dry shirts and shoes. The ladies manning the station fixed us a sandwich and a cup of hot tea and we got to work switching out our clothes and shoes. After savoring the hot tea and sandwich, we headed out with warm hearts and dry clothes, almost overwhelmed by the excellent care that the group had given us. Soon we were climbing up into the forest again, we power walked, than ran as we reached a more or less plateau on top. This continued on for several miles before reaching a steep, rough, single trail climb and corresponding downhill into the town of Freundenstein. 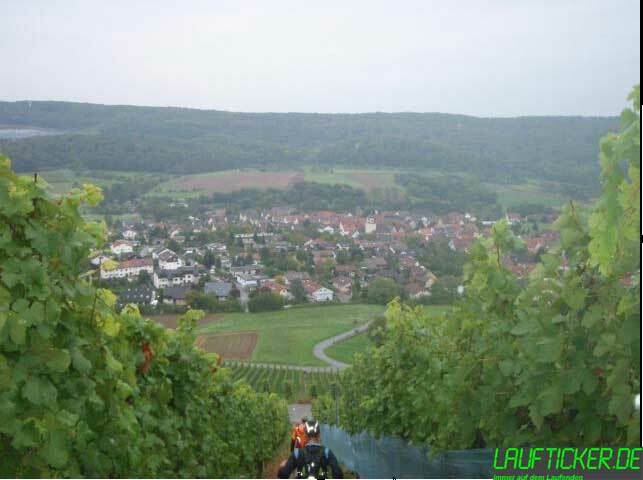 We had been warned about the ascent out of Freundenstein, an hold steep stairway leading up into the vineyards overlooking the town, with the continuing rain it was treacherous, we often had to use hands and feet to progress upwards over wet stone and grass. At the top it grew easier and we were able to run for a bit before the next climb. We wound our way through another forested section, eventually coming out on top of the "Horn", a scenic lookout point on top of the rows of vineyards below. Here we were to meet Bernd and his wife Uli, for fresh supplies. We were a bit earlier than planned, so we called them, with luck they were on there way up, about a minute away. After exchanging greetings we dug our bags out of their trunk and restocked our backpacks. It had stopped raining for the most part, so I decided to change all my clothes as well. Our friends sent us off with well wishes and a new energy. We ran a mile or so ahead and arrived at the next aid station. We didn't intend on staying long, but the offer of a cup of hot soup was just too much to resist. We joined another runner Harald, who had just arrived as well. After sipping our soup and chatting a bit we Harald decided to run with us through the night and we welcomed his company. The next section of the course had a few smaller climbs, but for the most part was fairly runnable. Harald provided a welcome distraction, we chatted about running and who knows what as we made our way through the now dark forest to Sternenfels. In Sternenfels we again met Bernd and Uli, taking a couple minutes to restock our CamelBak's. Then we bid the two goodbye, they were heading home. Together with Harald we climbed a steep hill out of Sternenfels, then ran on to the next aid station a mile or two further on. At aid station 5 we were again greeted with cheers and requests for what we needed. They had a Volkswagen van set up with a couple benches inside, as we sat down a motherly type wrapped us in a blanket as we sipped away at our drinks. I discovered some chocolate chip cookies on the table, they sure hit the spot. After a few minutes we set out into the dark forest, our light bobbing up and down as we ran. 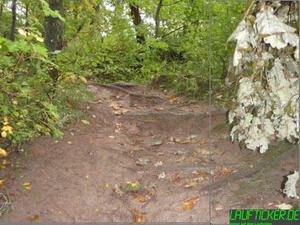 The course was in pretty good shape here, lots of mud puddles, but flat and rather easy to navigate by flashlight. We wound our way over the plateau for several miles, eventually arriving at a picnic area setting on top of a steep vineyard. Birgit and I had covered this part of the course during our training so warned Harald about the steep stairway (from heaven) that we were about to descend. The rain left the stone and concrete stairway treacherous as we made our way down to the village far below. I wondered out loud how many hundreds of steps there were. Shortly before arriving at the bottom we were met by two men from the aid station, they escorted to the bottom, than ran with us to the aid station in the town of Guendelbach. 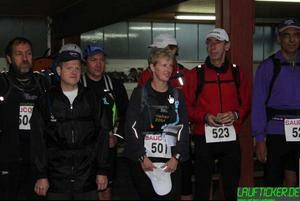 Aid station number 6 was located in a farmer's shed, which offered protection from wind and rain. The kind attendants filled us with hot soup, sandwiches and whatever else we asked for. I can only say I have never experienced such friendly care during a race, compliment! After briefing us on the upcoming trail section, and in particular about the wild pigs along the way, they sent us on with cheers and well wishes. We began climbing almost immediately, first a couple short flights of stays leading to a field above, than up a steep, muddy, hiking trail that eventually brought us to the top of a hill where I believe there used to be a castle at some point in the local history of the area. On this day it was a dark forest and home to numerous wild pigs. We had been warned that the pigs could be quite dangerous, if we spotted any we should make a lot of noise and in most cases they would run away. In any case we were running along with Birgit in the lead when all of a sudden she came to a quick stop, ahead of us were at least three pairs of green eyes looking at us and more movement all around. I didn't hesitate to start yelling my lungs out, followed by Harald and Birgit...I guess we must have scared about every wild pig, hunter, and runner for miles around out of their skin, cause it grew really quiet. We continued on, Birgit again in the lead, but a bit more hesitant. After awhile Birgit jumped back, as "something" moved in the bushes off to the side. We again woke up the dead with our yells and this time I took the lead, Birgit decided it was better to trip over roots that she didn't see rather than wild pigs. We moved on, this time without further incident, I guess the wild pigs sought a quieter place to dine. We made our way down the mountain side on an endless long, winding path, walking mostly to avoid flying over roots and stones in the dark. At the bottom was a gravel path that offered a chance to run a bit to warm up against the cold night air. The drizzling rain that kept coming and going did help matters. Later this and the upcoming sections of the course would prove to be our slowest. The course wound its way through the forest, crossed another county highway, then headed over a gravel, then asphalt path past a couple lakes towards Illingen. This section was still quite runnable, so we did our best to du just that. After awhile we crossed over a couple fieldways and made our way through Ensingen to the soccer field and aid station number 7. 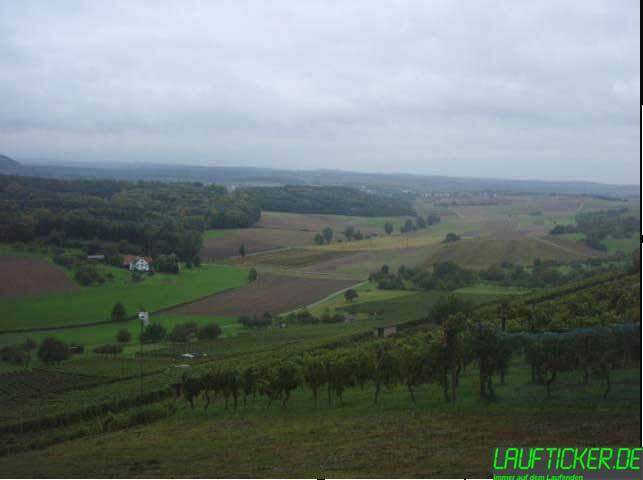 We also had drop bags at the aid station in Ensingen, so as we ate and drank I changed my shirt, socks and jacket. I wished I had some long running pants by this time, I was wearing longer shorts, but the rain and cool night air were working against me. I remember as I sat and waited for Birgit and Harald, taking inventory of our situation. We were at roughly kilometer 115 (mile 72), it was about 2:30 a.m. and we were a few minutes behind our planned race time at this point. The next part of the course was about 9-10 miles long, but had two very tough hill climbs and a couple equally tough and very treacherous downhill sections that would cost us time. We were also all yawning and you could see that fatigue was setting in. I decided to keep my thought to myself, as we got up and started walking up the next mountain. The climb out of Ensingen was tough in the daylight when Birgit and I trained here, but on this night in the dark with tired legs it loomed in front of us like Everest. Conversation was sparse as we made our way slowly up the steep incline, twice I nearly fell on my face as I failed to lift my feet high enough over one stone or another. At the top we turned right and headed over a plateau to a lookout point called the Edelsburg, it offered a fantastic view by day, tonight all was black. The asphalt road wound down the hill for awhile; we were able to run a bit, until the next muddy trail emerged. Eventually we emerged at the bottom, followed a county highway for a couple minutes, than turned towards the next vineyard. At first the slope was gradual, we ran for a few minutes on the asphalt path separating the fields. 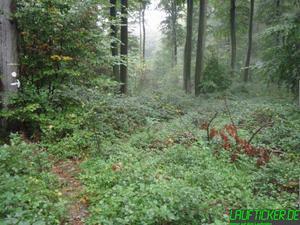 Soon we reached the wood line and turned and headed up increasingly steeper forest paths and single trail. Just as you reach the top, you go around the corner and head up some more, this continued for almost 3 miles before we finally reached the highest point on the race course, the Baiselsberg (477 meters). Here we had to stop and sign our names and our time in. We sat on stones for a minute and ate a bit, the next part of this section was downhill and we needed to make up some time. As we headed out again we met a group of mountain bikers coming up the hill, part of the support group checking on the runners. They warned us that the downhill before us was extremely muddy and dangerous, we should take our time! As we continued on down this certainly turned out to be the case, we could traverse some parts only by clinging to branches and bushes as we gingerly made our way down in the slick mud. How they ever made it up with their mountain bikes is a mystery to me. At the bottom we took a quick break to clean a bit of mud off the shoes and empty pebbles out of the shoes. As we worked, a light came bobbing down the hillside from where we had just come from. A runner that we had passed hours ago was on the rebound and making up for lost time. We ran on with him towards the next aid station. After a mile or so he stopped to walk and we kept moving, after the aid station we would be climbing again. We arrived at aid station 8 at the Kirbachhof, a large farm in the area, at around 6 a.m., almost an hour behind our planned time. This time I voiced my thoughts to Brigit, but we didn't need to say much, we both understood we need to keep moving. We tanked and refilled our supplies than headed out. The next 4-5 km was a steady climb, we had planned on walking the most, now we needed to walk quickly. I hit a low of sorts through this part, not so much physically, more mentally - I was tired, really tired, so tired that I caught myself closing my eyes and opening them a few feet further ahead - with luck we were walking a gravel road at the time. When we finally reached the top we started picking up the pace, running when it was flat or downhill, walking uphill, trying to make up some time. But we were hindered; Harald and I were both having blister problems by this time, a result of the constant wet feet and the slippery downhill sections. Every time a little pebble landed in my shoe I had to stop and dig it out or suffer with every step. Between Harald and I this was happening more and more frequently. Finally Harald stopped and said he needed to work on a blister, I decided to pop my biggest one as well and dry to tape it up. Birgit only said she couldn't stop, she needed to keep moving, I told her I would catch up. I hurried and fixed my right foot as best I could and saw that Harald was still working. I told him I need to catch Birgit now or I may not be able to any more. I knew another runner was coming behind us, so decided I needed to move now and started running. 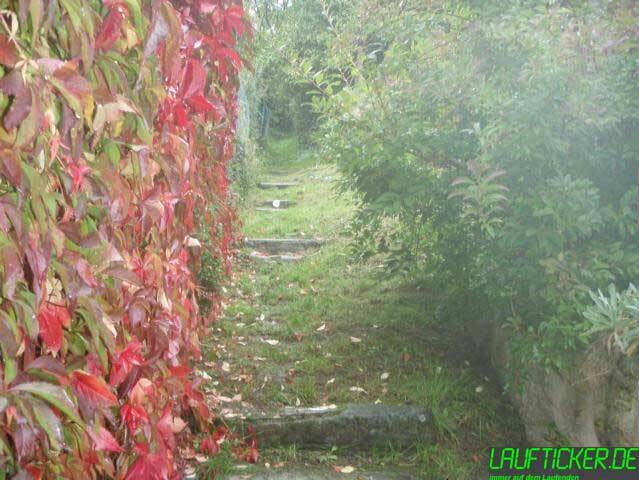 My right foot was hurting with every step as I ran over the gravel path trying to catch Birgit. She must have been running some too, as it took me nearly 10 minutes before I finally saw her. I picked up the pace as best I could and finally caught her. She asked if Harald was coming and I said he was still working on the feet, than we started running. The trail switched to single track and we weaved our way over some gentle rolling hills towards Sternenfels. Parts of the trail were slick and covered with stones and roots, we walked and ran as the tail warranted. Finally we reached the downhill portion leading into Sternenfels, it was steep and covered with mud, but we were used to this by now. We headed down, taking our time, hanging onto bushes and branches, and bouncing off trees until we reached the first plateau below. From here we had to traverse a steep, grassy downhill slope that proved a problem during our training, I slid down on my behind and it was dry on that day! 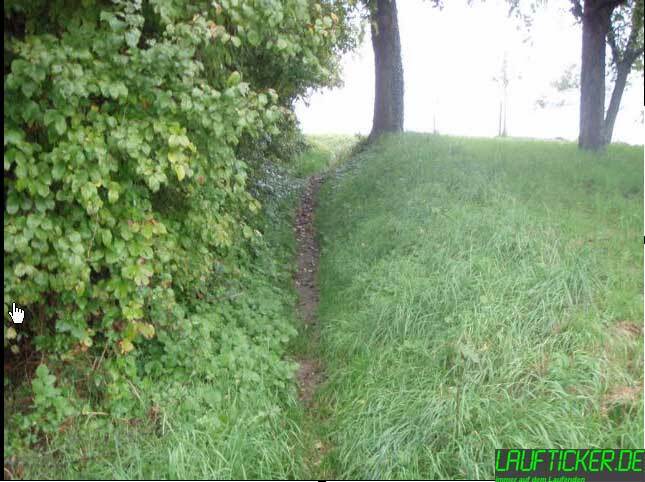 We took a quick look at the situation, than charged down the hill at an angle, staying in the high grass as we ran. Somehow we both managed to stay on our feet, may wonders never cease. I turned and saw another runner coming down using the same strategy, watch and learn! Birgit and I set out again at a run, time was awasting. The rest of the section to the aid station 9 Sternenfels-Leonbronn was rolling hills, we were able to run a good portion. We arrived at the aid station and were met by a friendly group of volunteers. Birgit took a minute to call her husband, who was meeting us at the finish line. I emptied my shoes from dirt and gravel and tried to get my head together for the last push to the finish line. We had roughly 3 hours and 15 minutes to cover 18 km (11 mi.) to the finish line before being disqualified. Normally we could do this walking, but at mile 89 of a 100 mile race, normal is no longer normal. I checked if Birgit was ready, than threw on my CamelBak and we headed out. I could feel the anxiety in Birgit as we ran on, she was the only female running the race on this day and did not want to let the women of the world down, at least this was what was going through my mileage-weary thoughts at the time. In any case I had terrible blisters on both feet and each step was pure agony, and the stony trail that we were following wasn't helping a bit. We kept moving, running most of the first 5 km without relenting. I cringed as I ran, every stone that I encountered sent pain shooting through my feet, but I kept moving, at some point I decided this was not about me, I could walk and probably finish in time...no, Birgit needed to get to the finish line, I kept moving. We had to walk several hills over the next 5 km, but we were gaining on the clock. 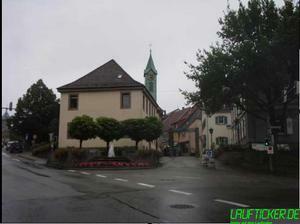 As we neared the edge of the town of Oberderdingen, Birgit stopped and said she wanted to change and shooed my on ahead. Somehow I didn't quite understand, but understood that she wanted me to keep going, so I power walked on ahead. As I entered the town the road went downhill, I glanced behind and saw Birgit catching up so started running, I knew she'd catch me. The sidewalks were somehow easier on the feet, I kept running, Birgit caught me and we ran until the road starting going uphill. We had at least 45-50 minutes, and the finish was only about a half mile ahead. We decided to walk. Finally we saw the sport hall and stadium ahead, with several people standing in front. One saw us and started yelling and running our way, Angelina, the wife of the race director! We arrived at the sports hall amidst cheers and walked through the doors that were the finish line together. We were greeted with handshakes and hugs from Wolfgang the race director, Angelina and several others. After 27 hours and 14 minutes we finished our first 100-Miler! Birgit and I gave each other a victory hug and were directed over to a bench to sit down. Several of the runners sat around us and offered congratulations. I sat and basked in the feeling of accomplishment for a moment, saying a silent prayer of thanks to my God for giving me the strength and ability, then asked Brigit how she was doing. She looked tired, but was aglow, about how I felt! Within minutes her husband Andreas and my wife arrived, they hadn't expected us so soon! I pulled off my shoes and socks and checked the damage, soon I had several people taking pictures of my feet, hmmm so easily amused. We let our spouses hover us for a bit, than hobbled over to the showers to wash off the last hundred miles of grim. The awards ceremony was first at 1 p.m., so I curled up on an empty cot in the corner for awhile. About 15 minutes before the ceremony Wolfgang poked me and a couple other awake and said we should get ready. I rejoined the others and waited patiently for the ceremony to begin. The fastest male (16:07:00) and the fast female (27:14:00) both received a marble plaque. The rest of us received a certificate, finisher shirt and some gifts from the sponsors. It was a real pleasure for me to see Birgit receive her plaque as the first female finisher, I can think of no one that is more deserving. We ran two marathons, two 50K, a 100K and 100M together this year, plus hundreds and hundreds of training miles. We had good days and bad days, but Birgit always kept going. I truly admire her courage, toughness and endurance, but also the love she has for her family and friends. Birgit you truly are a Superstar! Ever since I completed my first 100K race last year I have dreamed about running a 100-miler, but there are very few 100 Mile runs in Germany and the most were by invitation only and/or had qualification requirements that seemed beyond reach. I voiced these thoughts to various friends in my running club, the most thought it was extreme even for me. So it was much to my surprise when my friend Birgit contacted me one day with news about a new hundred mile race in our area in September. She was highly interested in doing the race, but her husband not, she needed a running partner. After thinking it over for awhile, probably 2 seconds I said let's do it, this is our story. Birgit and I trained throughout the year and ran several races together, sometimes with her husband Andreas (a 50K and a 100K), and sometimes just the two of us (a 50K and two marathons). Our crazy idea of running a 100 miles gradually grew into an organized race plan. 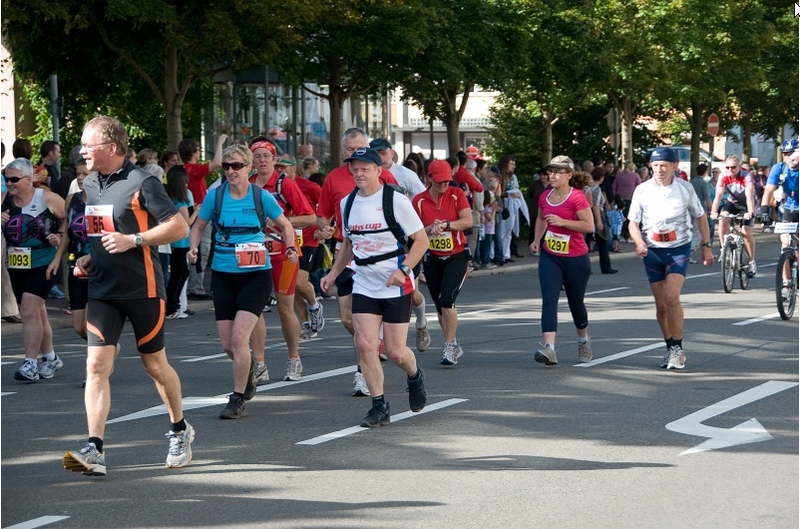 The Kraichgau und Stromberg und Heuchelberg (KuSuH) Trail 100 is a private race by invitation of the host. According to the race Webpage, "The race is a trail run, pure nature, with asphalt and civilization encountered only in the 7 unavoidable towns through which you run...you will stay on single trails (natural, roots, grass and hiking trails) and forest service tracks. Technically, some of these are quite challenging, even difficult, especially by night. 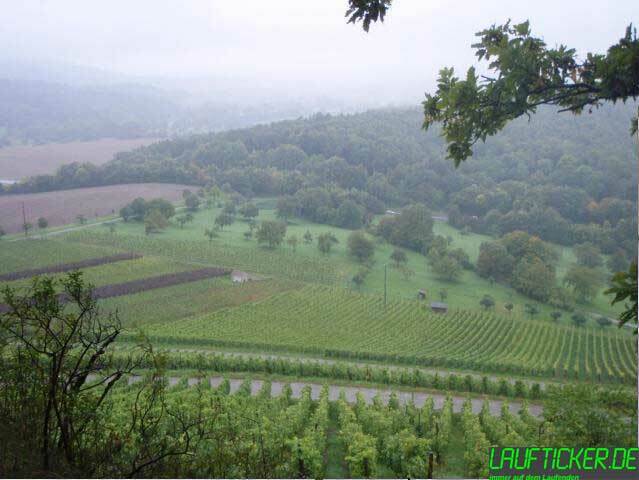 The landscape in our area is very hilly and heavily forested. Thus 80% of the KuSuH is located in the forest with a constant "up" and "down" covering a total elevation change of 2,500 meters..."
When Birgit and I arrived at the mandatory race briefing on Friday we had a good feeling, we had trained on 60-70% of the course and felt confident that we would be successful. After picking up our race packets, we mingled with the other 24 participants as we waited for the briefing to begin. 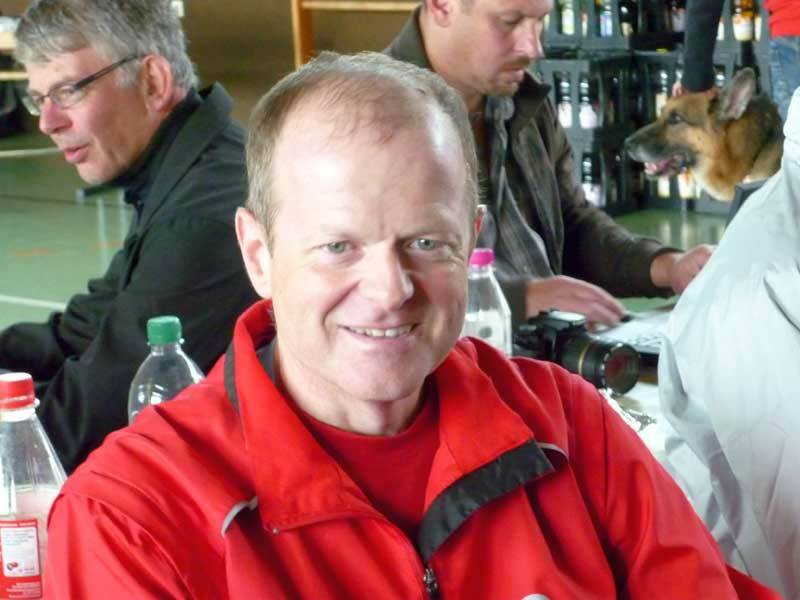 Wolfgang Hoefle, the man who dreamed up the KuSuH, an ultra-runner and now race director, along his wife Angela soon welcomed all of us. After covering important information for the race the next day, they and many of the volunteers joined us for a pasta party. Afterward Birgit dropped me off at home, before heading home herself for some sleep. The morning was rainy and cold (7°C/45°F) as I stuck my head outside at 4:45 a.m. on Saturday morning, not good I thought as I downed some breakfast and loaded the car. 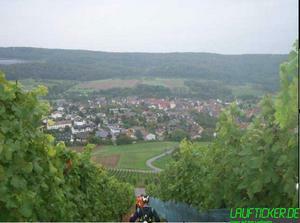 I arrived at Brigit's around 6:15, she was ready, so we loaded the car and headed to Oberderdingen. As we arrived we dropped off our drop bags in the tent set up for this purpose, than joined the other participants for breakfast. We chatted a bit with a couple runners as we downed our second breakfast for the morning, then headed to the car to get ready to race. At 7:45 we lined up with the other for some last minute notes and a photo session, then promptly 8 minutes before the 8:00 a.m. start, the race director played what will most likely become the official hymn for this race Led Zeppelin's "Stairway to Heaven", although I think by the end of the race most replaced the words "...buying a stairway to heaven" with "...climbing a stairway to heaven". As the music faded, we headed out as prompted on the 1st Annual KuSuH Trail 100. Friend Brigit and I finshed our first 100 Mile race today in 27 hours and 14 minutes! I'll try to get a race report together in the next few days. Typically tapering weeks allow me to catch up things that have been neglected during the high mileage weeks leading up to a race. This time around I have been so busy at work that I haven't gotten much of anything done on my "catch-up" list of things to do. Unfortunately my blog posting has suffered the most, I still owe a race report from the Pirmasens Marathon from September 12th. Since then I also ran a half-marathon with RB, where does the time go. This week I am concentrating on organizing my drop bags and other requirements for my 100 Mile race on Saturday, this has top priority as you can imagine. Tonight Birgit, who is running the race with me, and I are meeting friends Bernd and Uli for dinner, they will be crewing us for part of the race. If you have ever read a 100 Mile race report from the many runners who run and blog about this distance, you will usual hear about the wonderful support they receive from their crews and pacers. Crews in Germany are extremely rare, most runners rely on aid from the many aid stations at races, and perhaps the one or two drop bags that are allowed to be left at selected aid stations. Pacers are also rare and, as far as I know, not even allowed. There is no mention of crews and pacers in the race description for the KuSuH 100 mile trail race that I am participating in this weekend, I think it is just assumed that runners will make use of course aid stations and drop bags, i.e. will not use outside resources. Birgit and I have trained for a self-supported race, i.e. relying only on what we can carry and deposit at the two drop bag sites along the course. 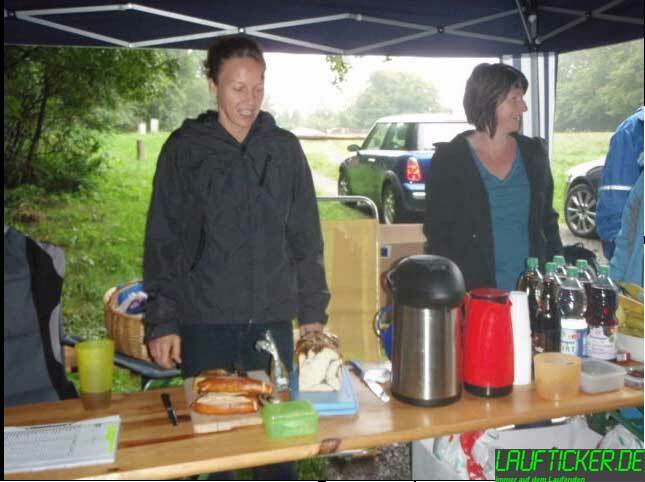 There are 9 aid stations along the course that will offer water, isotonic drinks, fruit, bread, cake and other treats, but these are 8-11 miles apart, so we will at least need to carry something to drink. We both decided on CamelBak backpacks and have trained with them over the last several months. Our friends Bernd and Uli have also offered to help out, probably in the form of meeting us once or twice to replenish whatever supplies or gear we may need, and some much needed moral support! Birgit and I have planned from the beginning on running the entire event together. If you are familiar with longer ultra races you probably realize that anything can happen along the way, one of us may not be able to continue. We really haven't talked about a plan B, but we both know each other well and if one of us is capable of continuing and the other not, we would deposit the remains of the other in the capable hands of attendants of the next aid station and continue on. Hopefully this will not be necessary, we are both very optimistic that we will complete the event, we have the experience, we have trained hard and conditions look favourable on race day. "This is no time for ease and comfort. It is time to dare and endure." "If you are going through hell, keep going." The following figure is the approximate elevation profile of my upcoming 100 Mile Trail race in Oberderdingen, Germany. The profile was made by piecing together our training runs that we made on the trail, plus filling in the gaps using the course description and maps. The profile was generated in Google Earth and scaled for easier viewing, but offers a pretty good idea of what we have before us. The lowest point of the course is 168 meters (551 feet) and the highest 474 meters (1555 feet). This is not a lot of difference, but as you can see from the profile the course continuously climbs up and down throughout the 100 miles, there are very few level sections that offer recovery. I haven't had time to prepare a report from the marathon on Sunday, but here is a picture, taken near the beginning of the race. 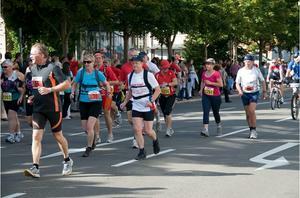 Birgit is in the light blue shirt with start number 80, I'm in white with a baseball cap. We were trucking along at about a 9:00 min./mile pace at this point, but we slowed down when we hit the woods. Today marks the beginning of my taper for the 100 Mile event. Yesterday (Sunday) Birgit and I did our last long run, a hilly marathon in Pirmasens, Germany which provided very similar course conditions as our main event. We pushed a bit harder than we have been running over the last couple months, arriving at the finish line shortly after five hours. I had sore feet and legs due to wearing almost new shoes (some people never learn) and Birgit arrived at the finish feeling good and fast enough to snag 3rd place in her age group! At the marathon yesterday we met Joerg, another one of the 25 signed up for the 100 mile race on September 25th. 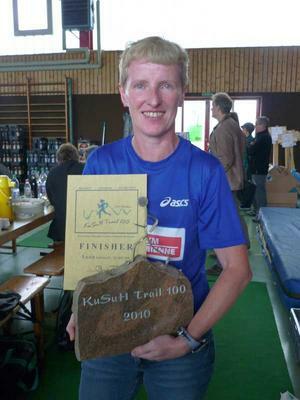 The KuSuH 100 Trail race is limited to only 25 runners, the organizers want to be able to provide optimal support. If all goes well this year they plan on expanding this in future years. "The race is a trail run. That is to say, pure nature, with asphalt and civilization encountered only in the 7 unavoidable towns through which you will run. However, these are small and some will only be passed on the outskirts. 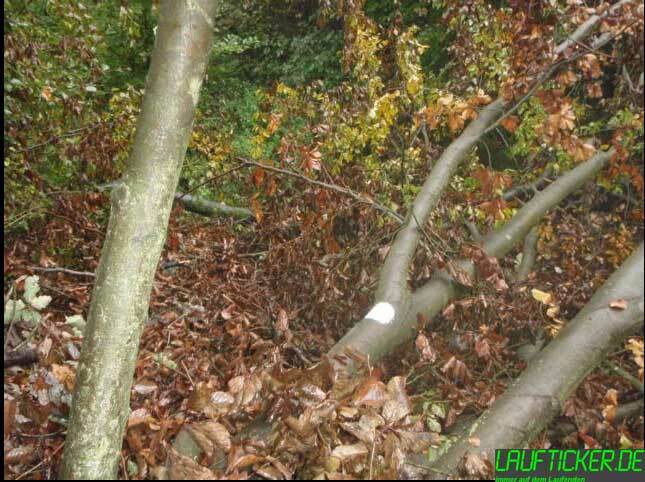 Other than that, you will stay on single trails (natural, root, grass, and hiking trails) and forest service tracks. Technically, some of these are quite challenging, even difficult, especially by night. The landscape in our area is very hilly and heavily forested. Thus, 80 % of the „KuSuH" is located in the forest with a constant „up" and „down" covering a total elevation change of about 2,500 meters. The course is very appealing from a scenic and cultural aspect and very beautiful, with many vista points, lakes, natural monuments, vinyards, and monastery excavations. You'll be travelling on century-old hiking trails (travel routes) such as the Grenzsteinweg, Waldenser Weg, Östlicher Rennweg, and Eppinger Linienweg. The „KuSuH Trail 100" is not easy! At least in our opinion. We may not have mountains or kilometer-long ascents or descents, but the constant „up" an „down" is certainly grueling. Add to that the tough trail conditions, fall hazard, orientation, running at night in a forest, wild boar, yard dogs, and mountain bikers. You should definitely be proficient at running according to a map by day AND by night. Even though the markings are adequate, it is still very easy to get lost in our parts, especially in the dark." The elevation change is supposed to be around 2,500 meters (8,200 feet), not as bad as many 100 mile races in the USA, but with a time limit of 28 hours it should be equally challenging. The race begins on Saturday at 8:00 a.m. and ends on Sunday 12:00 noon. Birgit and I are aiming for around 25-26 hours, but we don't have much leeway if things go wrong. This page is an archive of entries from September 2010 listed from newest to oldest. August 2010 is the previous archive. October 2010 is the next archive.